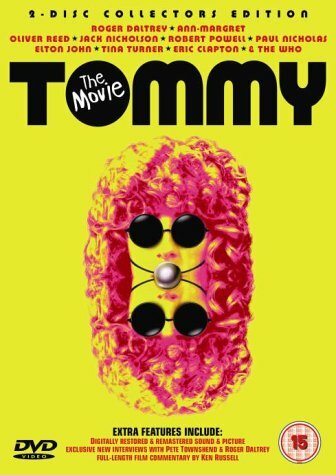 We now have the full details on Tommy which sees Roger Daltrey of The Who head an all-star cast that features Tina Turner, Elton John, Jack Nicholson, Ann-Margret, Eric Clapton and Oliver Reed. This two disc collector's edition will be available to own from the 14th June this year, and should retail at around £15.99. This specially restored widescreen version features 5.1 and quintaphonic sound as well as a full length commentary by Ken Russell with Mark Kermode, exclusive interviews with Pete Townshend, Roger Daltrey, Ann-Margret, and Ken Russell, a featurette on the sound restoration plus a featurette on the recollections of Tommy by the original technical personnel including Terry Rawlings the music editor. I'm afraid we don't have the official artwork yet, although we hope to bring you that very shortly. HEAR Jack Nicholson sing in 5.1. I have to buy this for the commentary alone, even though I already own the Superbit version. (oh what the hell, might as well buy this and new Orbital album). Last edited by Giles; 06-24-04 at 11:13 AM. even though I posted the cover, the copy I received in the mail, isn't really accurate: it's the lettering centered, minus the head. Can't wait to dive into the supplements on this disc! And I can't wait to hear about them! Just ordered from cdwow with $1 off with this link. Checkout total was $17.95 shipped which is the best I've seen. The official site is here with info and the insert booklet in PDF format. Can't wait to see a comparison at DVD Beaver. Rewind reports it is region 0 as well. I have so far only watched 'The Story of Sound' - the restoration of the quintophonic sound aspect of the film - at fifteen minutes, it's unfortunately kind of redundant 'talking heads' account of the mixing of the film, it's a missed opportunity to encode this part of the supplement in 5.0 sound since it would be interesting to hear the mono, 2- channel stereo and 5-channel mixes and compare the work and attention Russell and his soundmixers created for the film. Just ordered this for $6.95 shipped (after voucher) from CD-Wow.